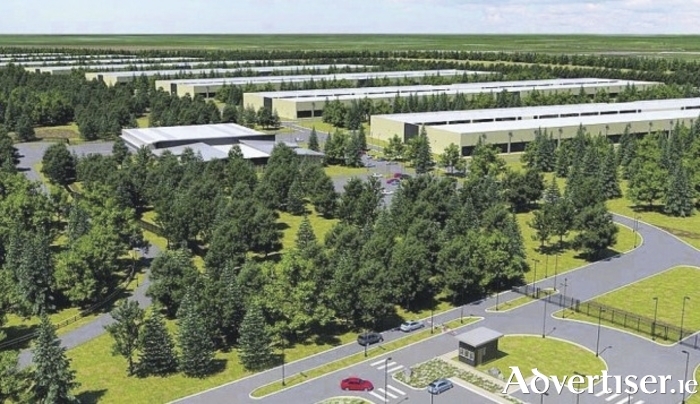 Artist's impression of what the proposed Apple Data Centre in Athenry will look like. A march to support Apple’s decision to site its latest data centre in Athenry takes place in the town this weekend, with organisers calling it a show of “solidarity with Apple” to illustrate that "the majority of the people in the area” welcome the multinational giant to east Galway. The march takes place this Sunday at 11.45am gathering at the railway station/church carpark and moving to the Square, where the gathering will be addressed by a small number of local people on the theme, ‘Athenry for Apple’. Apple’s decision to locate in Athenry, and invest €850 million into the proposed data centre was announced in February 2015. It was granted planning permission by the Galway County Council, but was then appealed to An Bord Pleanála. ABP granted permission but some objectors have since been granted a judicial review of that decision. This week Apple asked the High Court to fast-track a legal challenge which has stalled its plan to build the data centre. Last month, two applications to seek a Judicial Review of the decision by An Bord Pleanála to allow the Data Centre, were granted in the High Court. Two local residents are seeking a Judicial Review of the An Bord Pleanála decision, while a third individual who lives in Wicklow, is seeking a second Judicial Review. Among the organisers of the march is Athenry-based Fine Gael county councillor Peter Feeney. While he acknowledges "the right to object is there in law and some have chosen to exercise that right," he said the "wider community" in Athenry, and surrounding towns, villages, and rural areas, "have a right and an expectation that their young people have the opportunity to live and work where they have grown up". He pointed out that more than 3,000 children attend school in Athenry, and that within 15 miles of the proposed Apple site, are more than 50,000 young people secondary school pupils and third level students. "We need the jobs Apple will bring," he said, "and we need the jobs that will follow such a huge investment." "Since the initial announcement in February 2015 the people of Athenry have been anxiously waiting for the day that the Apple project finally starts. We have been patient, waiting for the Planning Application to be lodged, pleased at the decision by Galway County Council to grant permission, disappointed at the decision to appeal to an Bord Pleanála and then nothing short of heartbroken to hear that some of the objections have sought and been granted a Judicial Review of the Bord’s decision to allow the project to go ahead.